Chateau Angelus has just revealed that their 2012 vintage will be presented in black bottles imprinted with 21.7 carat gold writing. Signifying the first vintage to be bottled as Premier Grand Cru Classé “A”, it provides a good opportunity to look at the performance of this highest classification of Saint Emilion. The highest score awarded by Wine Advocate is indicated at the top of the above chart, and the bottle images indicate the percentage change in the mid-price within the last two years, as measured on the right-hand axis. 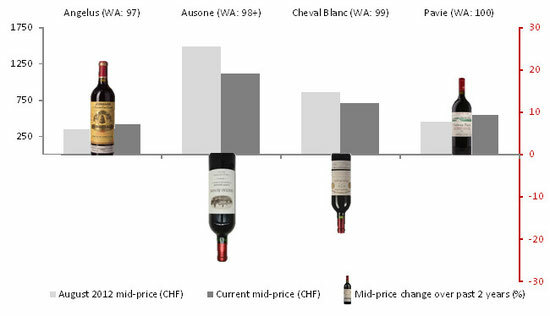 The convergence rates show that the cheapest of the four, Angelus, is gaining value more quickly than Pavie; whereas the most expensive, Ausone, is losing value faster than Cheval Blanc. Note that both Ausone and Cheval Blanc have experienced price declines since the market turned in 2011, so their correction is principally linked to Bordeaux market sentiment rather than any sudden glut of wines classified in the top stratum. The rates of convergence have changed, particularly in the last few months: Angelus and Pavie have held flat since the end of February, whereas Ausone and Cheval Blanc have accelerated their decline, losing 9.1% and 4.2% respectively over the last three months. If the trends continue, then these wines could settle around the SFr 500 per bottle mark, with deviations relative to their point scores. The highest priced mature Angelus in the market is the 96-point 1990, which has climbed 18% in the last year to SFr 600. Conversely, the highest price mature Cheval Blanc with market liquidity is the 98+ point 1990, which has come down and settled at just under SFr 900. This latter price might indicate a feasible ceiling for the mature vintages in this quartet of wines. Having started by looking at the new Angelus 2012 bottle, it is fitting to finish by looking at some recent vintages. With a current mid-price of SFr 220, and a score range of 94-96 points, the 2012 is very comparable to the 95-point 2006 at SFr 230, which is of course just entering its drinking window; equally, the mature 95-point 1995 has a mid-price of SFr 280 per bottle. No doubt the gold label of the 2012 will give an advantage over similar recent vintages (2011 and 2013), but that is more a matter for collectors in twenty-plus years, rather than promising any medium-term investment returns.